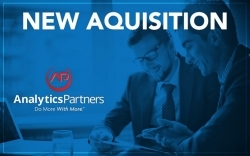 Tampa, FL, April 09, 2019 --(PR.com)-- HealthAxis Group announced the acquisition of Analytics Partners based in Jacksonville, FL. The merging of business operations adds robust and proven analytics to complement the HealthAxis Group’s current and powerful core platform and services. HealthAxis Group acquired Analytics Partners stock and assets and will begin consolidating all business under the HealthAxis Group brand.